You’ve tried every trick in the book, but those pounds just refuse to budge. Diets that promise everything but achieve nothing? Been there, done that. Intense exercise programs and workouts? Sweated an ocean, but still no results. “Miracle” drugs and pills that guarantee dramatic weight loss but fail to deliver? Yep, tried those as well. But before you give up hope, throw it all in, and reach for the nearest packet of chips, here’s something you may not have tried: bone broth. Bone broth is the hot new thing in the alternative weight loss realm, and for once, it may actually deliver where others have failed. Good-quality bone broth is positively overflowing with ultra-slimming minerals and amino acids. These include fat-busting calcium, stress-relieving magnesium, gut-nurturing gelatin and liver-supporting glycine. These nutrients are found in super-high concentrations in a good cup of bone broth, and work together to support your body in its quest to maintain a healthy weight. In addition, bone broth is incredibly filling, immediately quelling hunger pangs and leaving you far more satisfied than you would have thought from a simple cup of hot meat juice. As a result, bone broth can be a powerful weapon against hunger cravings, enabling you to space out your meals more and give tempting snacks the cold shoulder. And all this with a surprisingly low calorie count, as a cup of bone broth typically weighs in at only 50 to 60 calories. Happily, weight loss is only the tip of the iceberg for the health benefits bone broth provides. For starters, it’s great for your joints — the nutrients and minerals contained in bone broth help to support and strengthen your skeletal system. The areas in between your joints are comprised largely of cartilage, a slippery coating that allows the joints to slide over each other without friction. Animal bones contain this same cartilage, which is rich in collagen, glucosamine and chondroitin. When bone broth is made correctly, these compounds pass from the animal bones into the broth, and in turn are absorbed by your body when you drink or eat it. These nutrients are commonly prescribed by doctors as supplements for joint health, and have been shown through clinical studies to be as effective as the arthritis medication Celebrex in reducing pain and swelling, and improving joint mobility. All these benefits of bone broth come without the nasty side effects of over-the-counter drugs. Next, bone broth fights against wrinkles, stretch marks and cellulite. It’s a common misconception that cellulite is directly attributable to excess fat. In fact, cellulite comes from a lack of connective tissue. Bone broth can help with that. The high concentrations of collagen in bone broth help to rebuild connective tissue, improve skin elasticity, and keep wrinkles at bay. Finally, the bucketloads of gelatin found in bone broth can be instrumental in healing your gut. Gelatin is packed with glycine, a potent anti-inflammatory compound. It also has plenty of other gut-healing nutrients, including magnesium, proline and arginine. Alright, so you’re sold on the wondrous health benefits of bone broth. Enough said. But how the heck do you get access to the top-shelf stuff? There are plenty of companies that make high-quality broth and either ship it to your door or sell it in your local food store — you just have to know what to look out for. Check the ingredients for unnecessary additives and fillers — you really shouldn’t be seeing anything other than water, meat, and bones in the ingredients, and perhaps some salt. 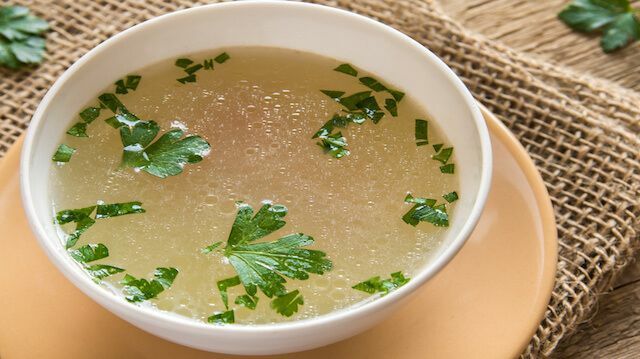 Those broths containing vegetables may be okay, but they’re merely leading you away from the good stuff — the gelatin that comes from the bones and meat! Try KOL Foods’ or Grow and Behold’s chicken bone broth — they’re tasty and nutritious. An even better solution is to make bone broth yourself — it’s super easy, and you’re likely to get an even higher-quality broth than anything you could buy in a store or online. What’s more, you don’t even have to buy any extra ingredients to make it — just place your chicken, beef or lamb bones in an airtight container the freezer after meals, and when you’ve gathered enough, add some water, vinegar and salt, and you’ve got yourself a bubbling pot of health. For detailed instructions on how to make bone broth, click here. Looking to really give those extra pounds the boot? These lifestyle changes have been proven to aid in weight loss and weight maintenance. Hey Buddy!, I found this information for you: "Not Losing Weight? Try Bone Broth". Here is the website link: https://www.thealternativedaily.com/losing-weight-bone-broth/. Thank you.